Jamala Wildlife Lodge is housed in the privately owned National Zoo & Aquarium overlooking the Molonglo River in Canberra. Guests at Jamala will share their surrounds with the giraffes, lions, bears, primates, tigers and more in among the 2.8 hectares of land. 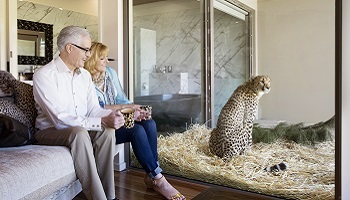 The 18 different suites are housed within African-like savannah enclosures, with the main uShaka Lodge built around the aquarium. There's an infinity pool and spa as well as an outdoor terrace where you can watch the monkeys watching you at uShaka Lodge. The jungle bungalows are built inside the spacious habitats of the lions, bears and cheetahs. 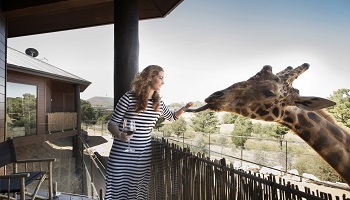 There are also six giraffe treehouses with balconies overlooking a reserve with an outlook to the Molonglo River. 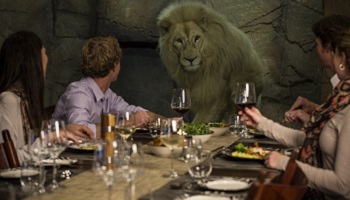 Guests are taken on two safari experiences with zookeepers, one in the afternoon, and one after an early breakfast. On these tours you'll get to pat dingoes, stroke snakes and learn about the zoo's breeding programmes. The morning tour is a highlight with backstage access to the top paddock where you can meet African hunting dogs, cheetahs, ring-tailed lemurs, and touch the surprisingly soft rhinos.